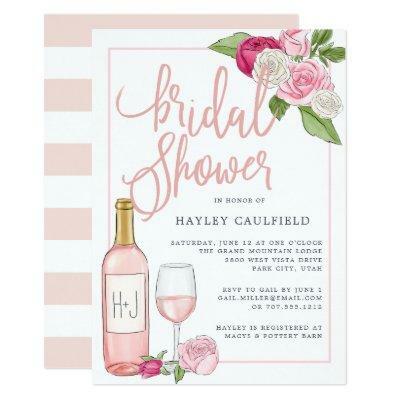 Elegant and modern bridal shower invitation for wine lovers features accents of roses in white, blush and fuchsia pink with lush greenery peeking out, and a bottle and glass of ros&#; wine. Personalize with your bridal shower details in elegant blush and gray-blue typography accented with handwritten style calligraphy, and customize the wine bottle with the couple&#;s initials. Cards reverse to blush pink and white stripes.